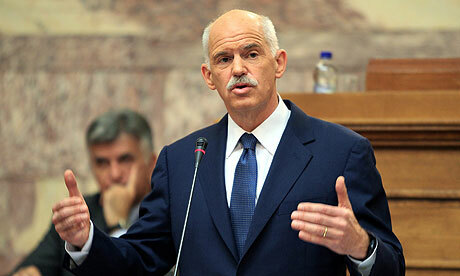 Prime Minister George Papandreou from Greece has lead his country so far through the financial crisis. But tonight he made a very unexpected move: after making a political deal last week e.g. by cutting the Greece dept back to 50%... he now wants to allow the Greece people to make a vote via a referendum... allowing his country to vote for the deal, or to reject the deal. Not sure if Papandreou is actually able to get enough support for his vote-idea - because Papandreou had previously pledged to hold a referendum in the autumn "on the great changes of this land". But I am quite sure that none of the other EU leaders will like his idea... because if Greece rejects the deal, the global financial world could easily enter in a state of chaos for a much longer time than we have seen in the 2nd half of 2008 - when the 'credit crisis' began (after the fall of Lehman Brothers - a former American bank). A - Has the Greece Prime Minister just designed his own political suicide, by making a gamble on the outcome of the referendum? B - Or is this the act of a very smart politician, just trying to win back the confidence of the Greece people? I had missed this piece of news! I have been following a man in Britain (Nigel Farage) arguing against Greece being offered this bail out as it forces the people to become enslaved to a debt and money system not suited for Greece's economy. He felt the people would rebel after a short time over having foreign bankers dictating their countries' budget. Based on what I know I say Hooray for this Prime Minister. I hope the people vote. Thanks for sharing his hand. Wooow.... George Papandreou appears to stand behind his idea for a Greek referendum about the EURO-deal!!! So, it looks like this idea for a Greece referendum about the EURO-deal could soon end-up in a new political situation in Greece, since Papandreou's wish for a referendum is unlikely to become reality. A - Papandreou might loose the vote for confidence that he sceduled yesterday as well to take place this friday - as a first step towards a referendum. B - Will Papandreou withdraw his proposal tomorrow during a meeting with Merkel & Sarkozy - NOTICE: Sarkozy's suggested today that there will be no alternative deal for Greece if the new EURO get rejected (which would probably implicate a default of Greece). C - Or... will mister Papandreou find another way out and survive with a glorious role as the Greece Prime Minister for the next few years??? D) Follow in the steps of Iceland and start over. Face the pain now and move on. Say no to the banker's new world order and a future global bank. This is probably the most critical issue. It is helping to reveal the weak links in the chain and how the chain becomes so dependent on all the links holding together. A small country like Greece has been placed in a position that its leader's decisions for his own country affects the entire EU if not the global financial systems. Most countries' citizens expect their elected leaders to place their countries' best interests and needs above that of other countries. What's best for Greece right now, may not be good at all for the rest of the world... so is Greece supposed to fall on it's sword. 1 - Island defaulted within only a couple of days after it got into trouble (and Island is a 'wannabee' for the Euro zone - which explains why they did not get much protection from the Euro zone, because the default was featured with conflicts with local governments in The Netherlands & the United Kingdom - who had stalled their money in Iceland sometimes only a couple of weeks/months before Iceland collapsed, etc.) . 2 - Greece is a part of the Euro-zone and the polls indicate that the Greece people do not want to leave the euro (they don't want to return to their former money-coin: the Drachme). So, stepping out of the Euro zone could end in a fall-apart of Greece as a nation - because there will not only be any money left to organize the government etc. And meanwhile the Euro-zone doesn't want Greece to step out neither. Because everybody knows that this step would be perceived by financial markters that Europe will likely also not be able to take care of the financial problems in other Euro-zone countries as well - such as: Malta, Spain, Italy... and maybe even Belgium & France ? NOTICE: The Euro-zone has already managed to take of Ireland; and meanwhile Portugal is doing better as well (compared to last year, when it had to ask for suport). Well, my former response explains a bit why at the moment there is no real 'best scenario' left for Greece at all - because both the Greece people AND the Greece politicians simply do not want to leave the Euro-zone. But what is missing right now is a 'new perspective' for especially the young generation in Greece, but it might first require a full-deault and a re-structuring of it's Government dept. However, before the Euro-zone is willing to organize a full-default, Greece will continue to be asked (forced) to ask the re-organize their society, e.g. by asking the richest people to pay taxes instead of giving their tax-agents only a few euros, etc. etc. etc. Another big difference compared with Iceland, where the people became the victim of a financial sector that became far to large to be saved by it's government. 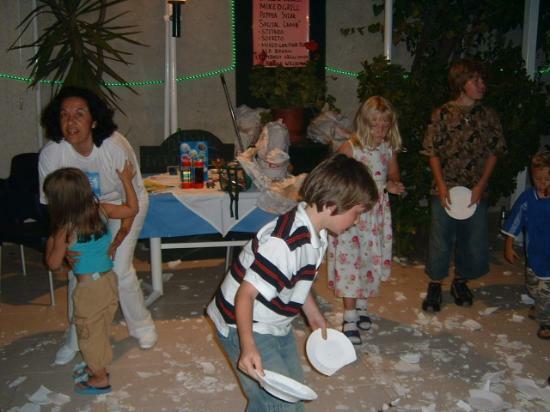 A children party in Greece? News articles I read last night said that 60% of the population do not want the EU's bailout agreement, based on a poll that was taken over the weekend. Papandreou said he didn't have the support of his people or his political party to accept the EU's offer. "Greece's government spokesman says a marathon Cabinet meeting has concluded with ministers expressing unanimous support for Prime Minister George Papandreou's surprise decision to call for a referendum on a hard-won European plan to rescue the Greek economy." "Polls in Greece have shown that 60% of the population are against the terms of the bailout but 70% are against leaving monetary union." Aha, thanks for sharing the update out the outcome of the meeting of the Greece ministers! This sounds like very bad news for the Euro-zone to me, because this implicates that Papandreou was able to convince his minister-team of this political suicide-plan (after some of them had expressed objections against the idea earlier today). Because US stock markets anticipated tonight with a small wave of optimism assuming that Papandreou's referendum plan could end later today. But now he has taken the first hurdle... convincing his team of ministers. I guess this implicates that his focuss will be on next friday, when he will ask the Greece parlement for a new 'vote of confidence'. Though, without any doubt, Merkel & Sarkozy will probably ask him to take back his referendum plan tomorrow. Yes, this quote exactly describes the Greece dilemma that I mentioned... if they choose themselves for a full-scale default, it might be perceived as an act of 'putting themselves into fire'... which could end up with uncertainty if the Euro-zone will be able to continue managing their financial problems. Let's be aware, the Greece problem resulted from that fact that they have been spending far much more money than they earned since Greece became a democracy in.... somewhere in the 1980's??? BREAKING NEWS - Well, looks like George Papandreou has indeed succeeded in finding support for the Euro-plan agreement in his country... but NOT via his 'risky' bailout-referendum idea! Today - after chaotic speculations about his resign in the Greece & international press - he has decided to start talks with the Greece oposition leader to form a NATIONAL UNITY GOVERNMENT. He has explained this idea himself to the press, but he used 'confusing' words - and so it remains to be seen if this will become the new alternative course for his referendum idea. 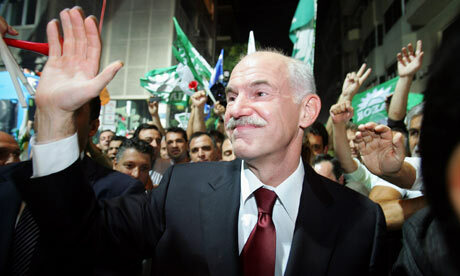 Wow... despite the expectations of the media, Papandreou has tonight survived the 'confidence-vote' as well! However, it remains to be seen whether his days as the Greece PM are now counted anyway, because in his speech Papandreou has speculated about leaving his position in order to get a new 'government of national unity' installed. For, it looks like that the Greece opposition probably doesn't want take a seat in a 'government of national unity' unless Papandreou gives up his own position. So at the end... Papandreou's referendum-plan will probably be remembered as a huge mistake - ending in that he probably has to give up his own position in order to get his country forward again. Since today George Papandreou is no longer the Greece Prime Minister - he was preceeded by the former vice-president of the ECB: Lucas Papademous has taken over all Papandreou's duties). So, it took a few days, but now it has become clear that Papandreou's referendum idea became indeed an act of 'political suicide'. In my view, George Papandreou is one of the few heroes of our times. He fell on his sword to try to save Greece from becoming a glob of the conglomerate of world bankers. And the power of the bankers won anyway. Since when do leaders *summon* other leaders? Don't they have the courtesy of requesting an important meeting. Merkle and Sarkozy demanded Papandreou return to France so they could 'tell him what's what' and who is in charge. Regardless of the fact that Greece fudged their books to get into the EU, it wasn't like it was a secret to any of the players. It's only a problem now, never a hidden fact. Big money players wanted Greece to join. Athough Papandreou failed, as might be said politically, it will be written that he attempted to give the people a chance to choose for themselves how to deal with a tough situation rather than having an international banker in control of dictating even harsher austerity measures. Greece died to save the rest of the EU. But it is likely only a temporary fix before we see another country fall into the homogenizer of bankers addicted to power and greed.